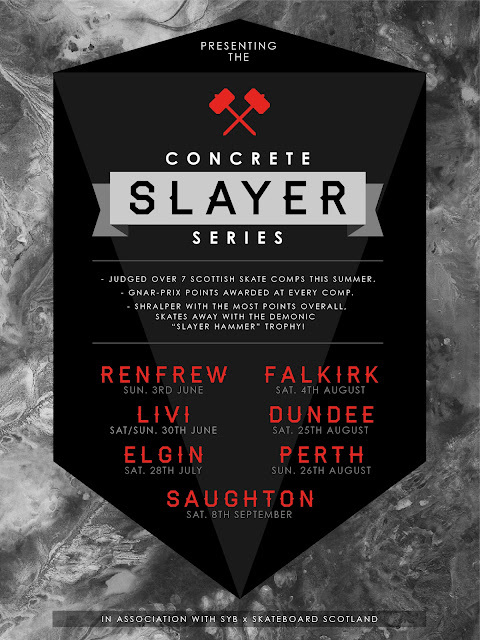 Skateboard Scotland have worked SYB and all your local skateparks to create the Concrete Slayer Series. This event brings together all of the grassroots skate comps that are organised during the course of the summer and we enable one skater to be crowned the Concrete Slayer. Daryl in Dundee is working on the Thor Style Hammer Trophy which will hopefully be awarded on the 9th of September at the Saughton Jam. Bring it on and keep an eye out for the results as and when they are posted. is there enter fee’s ? what do you get if you win ? Bit of Everything. Just a Rad Jam at every park. Get down and get involved.